I would buy this product again for a friend. Love it! I ordered this can opener because of my arthritis and it has worked very well for me. Love the can opener. Easy to use and store. I love the way i am able to do other things like stirring a pot, or washing a dish, while opening a can at the same time!! chair cover works fine love the bowls and the bed cover works fine! I can't use my right hand and these come in handy for me. I've ordered more than one. Love that it stops when it is done opening the can. This is the best can opener I've ever had. Finally wore one out in 8 years and bought a different brand. So glad I found this one again as I really like it so much more than any other can opener I've ever had. Cuts the cans clean and I can now open cans with my arthritic hands. Easy to hold and use. After having a stroke, it was impossible to use a regular can opener with just one hand. This has been a real life saver since I live alone. If you have arthritis in hands, it makes it so easy to open a can goods. I love it. When I ordered this can opener I must admit that I had my doubts. I WAS WRONG...this little can opener works great. Does just what it is supposed to do and I had no problems with it (me being a leftie and all). Thanks MK for a great product. Great Idea, no pain when opening a can. I love this product. I have carpal tunnel in both wrists n have pain in both of hands. Using a manual can opener hurts my hands. This is so easy to use. You'll never use a conventional can opener again! I love this can opener. Best can opener I have ever owned. Great Buy. Just Love it. I had this can opener for a long time. It finally died on me and I purchased a similar one from another company. Big mistake. It didn't work from day one. It's was trash. I won't be fooled again by look a likes. I ordered another one of these. Would buy this product again! In fact plan to buy one for my daughter! Doesn't take up space on counter, easily fits in drawer for easy access! Just everyday use, to open cans. I said it all above. The Hand Free Can Opener, is really handy opening cans. I buy a lot of can goods. It made me aware of the labor I was using opening all the cans before, I bought it. I just put the comfortable grip can opener on the cans a let it do its job in just a couple of seconds. Loved it! Finally, a reliable can opener! I've had one for a few years, and have bought several for gifts. They are great for ladies with a little arthritis in their hands, or for someone who cooks in a hurry. It always works except on really thick metal cans. That's rare. Love it! I've been looking for this can opener for a while. I had one like it years ago, and really liked it. It works well, is fast, and the best feature about it is that it stops automatically. All the others I've tried, other than the first one, had to be manually stopped. Although the description doesn't say if it does stop by itself, the price was only half as much as ones in the store, so I decided to take a chance. I'm glad I did. I use this to open all my cans. It even works on smaller cans too. I place it on my can press the button and it automatically stops once done. I never had a problem with it not working. It works fast and if you put it on the can properly it gets the job done. Great product. Wish I would have bought sooner. Arthritis is so bad in hands its hard to use a standard opener. makes housekeeping so easy. The price, is also unbeatable. It is a marvelous opener. I would suggest the you tell people it has to sit on a can in order to work. Couldn't figure it out at first, but once it started I was amazed. I liked that it doesn't leave a sharp edge. Can't live without it ! I was thinking this opener would be like others I have purchased in the past that were hard for me to use and did not always leave the lid able to be removed. Of course there were usually sharp edges to deal with too. This opener really did surprise me with its ease of use and I have not had to struggle with setting it on any of the variety of cans I have had to open. I love it and have purchased one for my friend with RA. Didn't think it would work so good. After installing batteries the can opener went to work opening the can like a real pro. Couldn't ask for anything more. I had one before that finally wore out so I got another. This one works just as well. I love it! I am a retired senior with limited use of my right arm. I also happen to be right-handed! This is great for opening cans, because I do not have to turn, grip or hold anything. Just attach it to can, press button and walk away. Couldn't be easier! I can't say enough good things about this device! It is incredibly easy to use, is less messy than a traditional electric can opener, takes up less space, and of course works without electricity. The top of the can comes off without the usual sharp edges. I have Arthritis in both hands and wrists. This hands-free opener is the first one I've found that is truly pain free to operate. Could not be easier to use. Got to have this in your kitchen !!! This has been the best can opener I have ever used. No more trying to twist or turn a conventional opener and trying to fit a can on an electric opener under a cabinet is now a thing of the past. Getting a great deal while they are on sale. Makes a great thoughtful gift. This is a wonderful, useful gadget, especially for a senior citizen. I use it every day from small to really big cans. I have arthritis in my hands and it has helped a lot. Nothing negative to say. All ages can use this.This is God Gift to kitchen.I love iy,my wife love it.I just want to say,Thank you. This battery can opener is one of the best can openers. Easy to use. Put it on a can of 'anything,and ' off it goes! No sharp edges. Keeps fingers safe! I HAVE TROUBLE WITH MY HANDS AND THIS IS SO EASY TO USE.IT CUTS LIKE A DREAM. I now have hand issues. This was a great problem solver for me. They work just like the advertisement. I bought 2 can openers for my sister and myself. Both of us have arthritic hands/fingers. The can openers help open cans without that pain. Really love them! OMG-WHERE HAVE YOU BEEN ALL MY LIFE?? I ordered this because all the other can opener I had did not work - WOW what a great surprise when I first used it....It does all the work for you, Gosh my family & friends love it too....I know what to get them for Christmas now....Thank you for making this item....Love it. Very easy to use especially if your hands and fingers don't work well. I purchased this can opener which replaces another one that opened cans without leaving sharp edges, however due to arthritis in our hands, husband and myself were having difficulty holding and turning the old one at the same time. This one doesn't cause those problems. I would tell folks that don't think it's not working when you first try to turn it on, it needs to be actually seated on the can in order for the motor to work. A piece of information that could be noted in it's description possibly in the catalog. I was thinking that I would have to send it back, but not so. I am really going to love this. I have very arthritic hands and have trouble opening cans. I bought one that worked beautifully until I tried to open a non-round can. I broke it. Instructions do warn you not to use it on non-round cans, which I read too late. I did order another one. I would buy product again. Product will not turn on unless you have it on a can to open. So far, so good. I'm still learning exactly where to place the can on the opener correctly. Like that it automatically stops itself. I read reviews before purchasing. Most of the cons were about irregular cans not being able to be opened with it. It says clearly in the directions that it cannot be used for irregular cans. The directions also clearly say you have to hit the button two times for extra wide can tops. It also says you must remove it and put it back on just before the last cut for those larger can lids. When used as described in the directions it works very well. I would be sure to keep the cut can away from children however because the edge is highly sharp. The removed lid though is quite smooth. 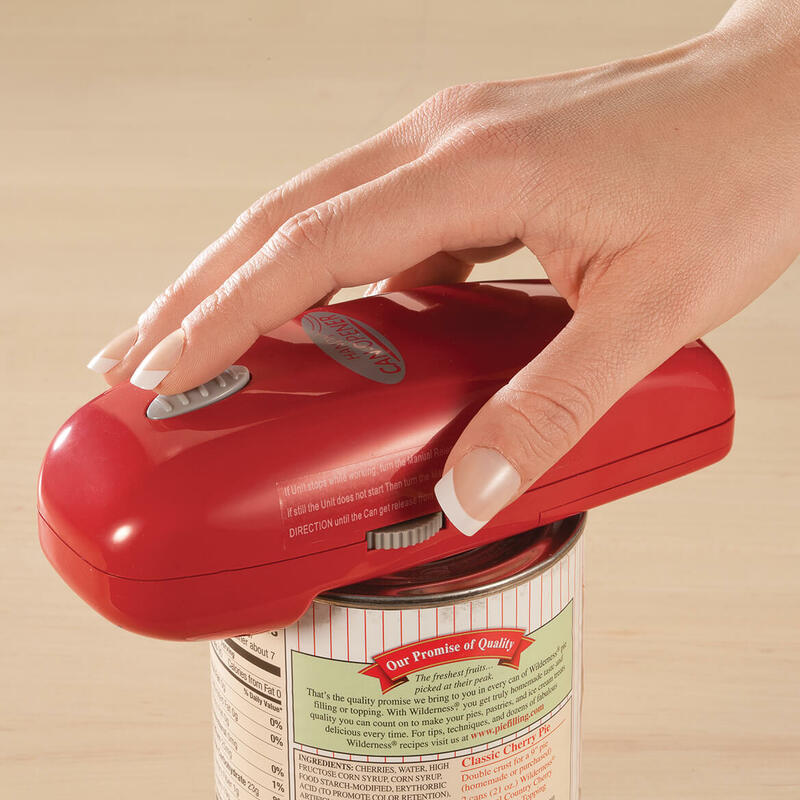 This can opener works well for those with arthritis or difficulty turning conventional openers. I opened a few cans. Had a problem with it not stopping when the can was completely opened. Did that on about 2 of the cans. Purchased for husband who only has use of one hand. This can opener is great for one-hand use. Convenient when the power goes off. Easy to use even if a person has hand problems. Easy to handle when opening cans easy to keep clean. I purchased and used three of these over the years. The one I have now came off the can with the lid stuck behind the blade. I cannot get the lid out it won't turn on and move the blade up. I don't know how to get the lid out. I'm afraid to force it out or use a prying tool because it would probably break the blade. Easy to use, no sharp edges. Have only had one can that it would not open. Lightweight to easily take from home kitchen to kitchenette at our business. Best can opener for larger cans that I've tried. This 3rd opener I've gotten. Last 2 were gifts after friends saw conscience!! I purchased this can opener in July 2015. It was working fine and I was very pleased with it until last week. Tried opening a can and it slowed down mid opening cycle. I assumed the batteries needed replacing but when I was finally able to pry it off the can and replaced the batteries, the same thing happened. Problem is now I can't get it to release it's grip on the can. Sadly, I passed the 45 day replacement period so I'm out the opener and my money. Be forewarned, that this opener is not for the long haul. Took awhile to get it started. I was using it on a 12 oz can of tomato paste. We'll see how it works next time. I SAW THIS WORK, BUT THE ONE I REC'D GOT JAMMED. THEY WERE NICE ENOUGH TO SEND ME ANOTHER ONE. HAVEN'T TRIED IT YET. HOPE IT WORKS. I would not buy again! I would like to get a refund, I feel this was a defective Item. Half way around the can the opener stopped. I did exactly what the instructions said I spun the wheel clockwise, nothing. I spun the wheel counter clockwise, nothing. The lid was stuck. I tried removing the batteries thinking that might reset it. The batteries were scorching hot, I'm surprised they didnt explode. Wrestled with this thing until I was dripping with sweat and highly irritated. This thing was 100 times worse than the manual opener I was trying to replace. I had to use brute force to get the lid off the can with the opener stuck to it so I could get my diced tomatoes out of the can. I probably won't get my money back because there is a piece of tin still stuck between the blades and the plastic is all scratched up from trying to pry the thing off the can. Really ticked off. I hope the manufacturer enjoys the money that he ripped me off for. Not only do I want to throw this thing in the trash it would give me great pleasure to beat the heck out of it with a hammer, douse it with gasoline, light a match and watch it burn. This is how ticked off this thing made me! Don't buy this! Bought this even after reading negative reviews. Was hoping for a good one. This never worked from the first try. Company was good about a refund. Don't waste your time and money. Put new Duracell batteries in but never connected to the can properly. Ended up buying an electric one that works.Would not even rate this one star if that was an option. The first time I used it, it would hesitate in certain places. At first I thought the battery I used was not good. Then after changing the batteries it did the same thing and eventually stopped working altogether. I hate it. Could not get this can opener to operate even once. Tried three times. New Batteries and still the Motor does not have power to open the can. No way to stop the dumb thing. had to drive it to completion using the thumbwheel to get it off the can. I purchased this item, as it is extremely difficult, with my RA to use a can opener. I have a "one touch" jar opener, that I love. This can opener is NOT working, even my daughter tried & can't get it to work. This can opener was the worst I have ever purchased. This can opener is the worst one I have ever purchased. It gets stuck every time I have used it and you have to fight with it to get it off the can.it never opens the can I finally threw it away still stuck on a can. The can opener does not work. Can I get a replacement? Batteries were put in and can opener would not work. battery changes it never responded. Thew it in the trash. I could not use the product. It did not even buzz. changed batteries twice and it still would not work. Threw it in the trash. The opener worked twice and then never worked again. I followed the instructions and it still didn't work. In the garbage it goes. Iam very disappinted in this product. onlyit works a couple of times then it grabs the can and won't let go.I,m very disappointed about this. I put new batteries in it and the batteries moved around a lot and it would not work,so I returned it. I returned it yesterday ? ?.It kept stopping. Then I couldn't get the lid off the cutter. Terrible! Plus I had to pay $5.00 to ship it back. Push the button,motor runs stands in one place,wont open can.What a piece of junk . After many irritating tries, I finally got it out of the damm hard plastic. Then I spent another half hour, putting batteries in, taking batteries out, turning them upside down & backwards, & it still doesn't run. I will try again when I have more time. if it still doesn't run, it will go in the garbage, not going to spend any more money on it. As far as I'm concerned, its a piece of junk anyway & thats where it will go. Not Miles Kimball fault, totally the ones that made it. Maybe it will work if I could just get it to turn on. Oh yes, my batteries were brand new. Thumbs Down for this one! It would have been a great product if it would have worked on more than three or four cans! I love it when it works, which was for a few weeks. Then it slowed. I replaced batteries. Kept stopping mid circle; finally totally quit and wouldn't release the lid! I put batteries in and did not work. This is a piece of GARBAGE that is worthless. It's pourly made. Why are you selling item that doesn't work???? Doesn't hardly work at all. Kept stopping and had to to use crank on side to get it around can. Can is vey sharp when lid is removed. description is a lie. Can Opener does not work: I even had the lst one replaced, 2nd one didn't work either. Junk, didn't work at all. Sent it back to you for refund. I put 2 sets of batteries in this opener and cannot get it to work. Sent email to customer service. DIDN'T GET TO USE IT AT ALL. It did not work at all! It would not make it around the can and then I could not get it open to remove it from the can. I would never use this thing. Hands free can opener is so easy to use! Your Company did not have a stand up canopener .I am willing to try this. Have a friend that has this and will be helpful opening cans. I chose the hand free can opener due to inflammation of the wrist in hopes that this will make opening cans much easier when cooking. I own one already and I love it. This will be for my daughter. Have one now and wanted another on hand. This works really great and I have one. This is for my 92 year old mother. I have one of these already and I love it! It really works great! I'm buying 2 more to give to my 2 daughters! Wife needs a new opener!! I am limited on my arm and hand strength not having to grip the handles will be great. Repeat purchase. Open cans while do g other prep. my old one doesnt work. I need this because it''s easier to handle. Purchased one a while ago. It worked so well we bought one for our summer home and for our children. I already have one like this and will give these to grandkids. first time trying this item. I need two more for my other homes! I love the one I have now ! I have had one before and they are very handy and easy to use.Regular can openers can be hard to use but these are wonderful. Can this opener cut large cans? BEST ANSWER: Thank you for your question. 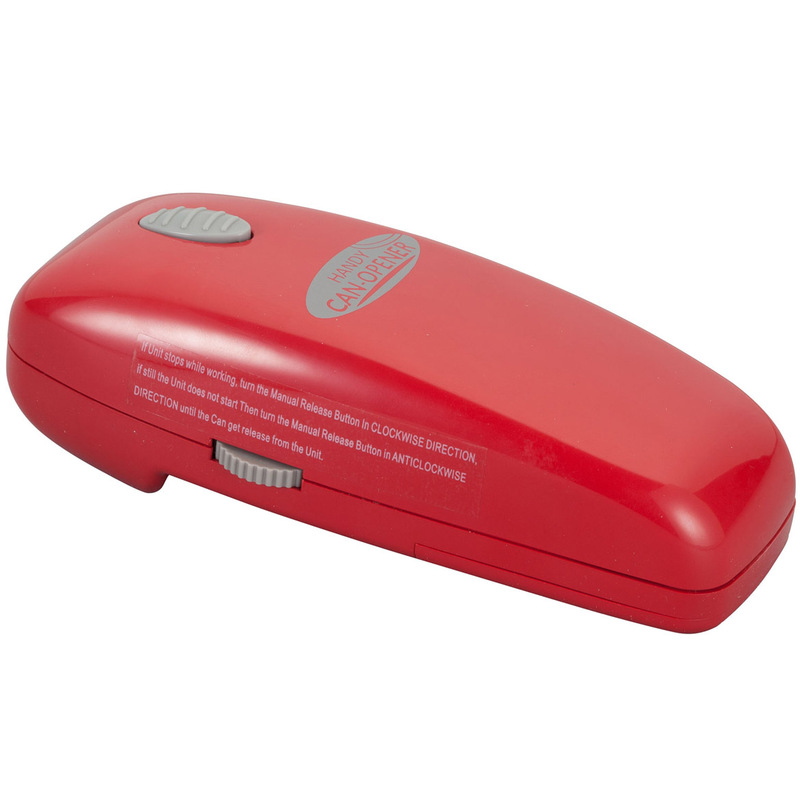 The Hands-free Can Opener can work on larger cans and comes with the directions on how to operate the opener on larger cans. We hope this information will be of help to you. What country does this come from? BEST ANSWER: Thank you for your question. The Hands Free Can Opener is made in China. We hope this information will be of help to you. Can't you even give me a number to check my order!!!! does it have an extended cutting blade below the opener? does it come with a guarantee ? BEST ANSWER: Thank you for your question. We have a 45 day return policy. As long as you call us with in that time we will be able to help you. We hope this information will be of help to you. does it need to be on a can before it works? BEST ANSWER: Thank you for your question. Yes, you need to have it on a can. We hope this information will be of help to you. Received one for christmas will not work? What advice can u give me ? BEST ANSWER: Thank you for your question. Please contact Walter Drake Customer Service at 1-800-858-4976. We hope this information will be of help to you. Is it both electric and battery operated? BEST ANSWER: Thank you for your question. The opener is only battery operated. We hope this information will be of help to you. How Large Can will the opener open? BEST ANSWER: Thank you for your question. The can opener will work with any standard size can for fruits or vegetables, but will not be able to open fish or meat tins. We hope this information will be of help to you. BEST ANSWER: Thank you for your question. Our products are not available in stores, you can order via our website. We hope this information will be of help to you. BEST ANSWER: Thank you for your question. The Hands-free Can Opener takes two AA batteries. We hope this information will be of help to you.